The Eighth Floor Artist Gorp. is pleased to announce an exhibition of new paintings by the Swiss artist So-Un (Han-Kyoung) Lee. 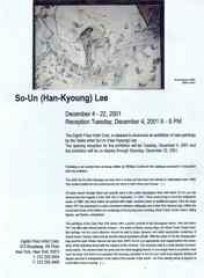 The opening reception for the exhibition will be Tuesday, December 4, 2001 and the exhibition will be on display through Saturday, December 22, 2001. Following is an excerpt from an essay written by Whilney Combs for the catalogue produced in conjunction with this exhibition. Of some recent strongly literal and specific work is the series Apocalypse New York which So-Un Lee has derived from the tragedy in New York City of September 11, 2001. These works bring to mind the calligraphic series of 1999. Uke them letters are painted with bright, brushed colors on traditional papers. Here the large letters "NY" are presented in a style somewhere between calligraphy and a New York Yankees logo. WIthin the broad black lines of the letters are renderings of the burning and crumbling World T rade Center towers, falling figures, and flames, everywhere.